Music, splashing, girls giggling, a coach loudly giving instructions, this is a scene that Sophia Tsives is very familiar with. 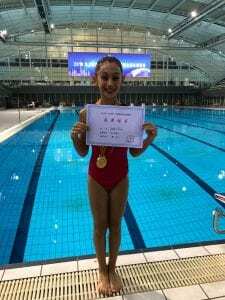 Sophia, a Year 6 student, is a synchronised swimmer. Sophia explained synchronised swimming as being a combination of swimming, gymnastics and dance. “I love it because it combines my favourite sports,” exclaimed Sophia. Sophia began swimming when she was just three years old and when she was six, she decided to try synchronized swimming. She began classes when she lived in the United States and continued when she arrived in Shanghai. “At first, it was hard to find a synchronized swim team in Shanghai, but I finally found one and tried out.” Sophia says that they accepted her on a local Chinese team but only one other girl speaks English on the team. She was a little nervous at first but has easily adjusted. “I like my team and it has also helped me learn more Mandarin because I have to listen to Mandarin and speak with the other girls in Mandarin too.” Sophia likes participating in synchronised swimming competitions and has competed in one in Shanghai with her team. Sophia also attends gymnastics classes and likes most physical activities. She says, “exercise like sychronised swimming helps me relieve stress and feel good.” Sophia has been at YCIS for four years and has an older brother in Year 9. She says that she likes YCIS because students are friendly and caring, and that teachers are nice and take time to explain things if you don’t understand.